Elizabeth Slayton attended the Boston Museum School of Fine Arts, Penn State University and Massachusetts College of Art. She has been painting and exhibiting for more than 30 years, showing in solo and group shows throughout the US and abroad. Her paintings are included in private and corporate collections. Gregory A. Abel is a medical oncologist and researcher at Harvard Medical School. His poetry has appeared in the Journal of the American Medical Association. Allison Alsup lives in New Orleans where she teaches part-​​time and helps her husband to restore the city’s never-​​ending supply of lovely, rotting cottages. In the last two years, three stand-​​alone chapters from her novel-​​in-​​progress have won national writing contests. Other fiction will appear in River Styx and the Madison Review this summer. Chad B. Anderson was born and raised in Virginia’s Shenandoah Valley. In 2009, he earned an MFA in fiction from Indiana University and was a resident at the Ledig House International Writers’ Colony. He lives in Washington, D.C.
Amy Ash, a graduate of the MFA program at New Mexico State University, is pursuing a PhD in Literature and Creative Writing at the University of Kansas. Her poems have been published in Lake Effect, Cimarron Review, Harpur Palate, and Mid-​​American Review. She is the recipient of an Academy of American Poets prize. Michael Barach, whose work appears in journals such as River Styx, Fifth Wednesday, Bayou, Reed, and Entasis, has worked as an editor for Moment Magazine. He has an MFA from the University of California, Irvine. Michael was born in Philadelphia, PA.
Dara Barnat’s poetry has appeared or is forthcoming in Poet Lore, Crab Orchard Review, Green Hills Literary Lantern, and others. Her chapbook Headwind Migration was released by Pudding House Publications in 2009. She is completing a PhD on Jewish American Poetics at Tel Aviv University, where she teaches poetry and creative writing. Curtis Bauer has published and has poems and translations forthcoming in Fulcrum, the Dirty Goat, the American Poetry Review, the Iowa Review, Circumference, and Tar River Poetry. He won the John Ciardi Poetry Prize for his first poetry collection, Fence Line, published by BkMk Press in 2004. He teaches creative writing and translation at Texas Tech University and is the publisher of Q Ave Press Chapbooks. Denise Bergman is the author of Seeing Annie Sullivan, poems based on the early life of Helen Keller’s teacher, and, forthcoming, The Telling. She conceived and edited City River of Voices, an anthology of urban poetry. An excerpt of her poem “Red,” about a slaughterhouse, is permanently installed as public art. Pamela M Cersosimo is a Vermonter transplanted to the mountain west, where she has returned to poetry after a long absence. This is her first publication. Jesseca Cornelson is an assistant professor of English at Alabama State University. Her poems have appeared in Cellpoems, The Dead Mule School of Southern Literature, The Other Journal, and Willows Wept Review. She is a native of Mobile, Alabama. “A Body by the Wayside Strange” references the lynching of Michael Donald in Mobile by the local KKK in 1981. 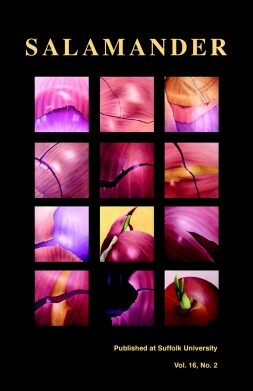 Steven Cramer’s fifth collection, Clangings, will be published by Sarabande Books in 2012. His previous collection, Goodbye to the Orchard, won the Sheila Motton Prize from the New England Poetry Club and was named an Honor Book in Poetry by the Massachusetts Center for the Book. He directs the low-​​residency MFA creative writing program at Lesley University. Elizabeth Crowell has published poetry, fiction, and nonfiction in many publications. Her essay “The Tag” recently won the Burns Archive Prize for Nonfiction, judged by Jerome Groopman, MD. She is an English teacher and the interim chair of the English Department at Lexington High School in Lexington, MA. Weston Cutter is from Minnesota, has had work recently in the Southern Review and Ploughshares, edits the book-​​review website Corduroy Books, and has just had his first collection of stories, You’d Be a Stranger, Too, released by BlazeVOX. Diana Der-​​Hovanessian has taught American poetry at universities here and abroad. Her latest book is Dancing at the Monastery (Sheep Meadow Press). Her 25th, a volume of translations, is due this summer. Her work has appeared in Harper’s, Agni, APR, Salamander, etc. Carol Dine’s book Orange Night, a collaboration with artist Samuel Bak, is forthcoming. She received a grant from the Money for Women/​ Barbara Deming Memorial Fund for her poem series “Resistance.” Her most recent book is Van Gogh in Poems (Bitter Oleander, 2009). Brandi George’s works have recently appeared or are forthcoming in Cimarron Review, Fugue, Harpur Palate, Quercus, Diagram, and Best New Poets 2010. She was born in rural Michigan, received a B.A. from Michigan State University, and currently resides in Tallahassee, where she is finishing her MFA at Florida State. Rebecca Kaiser Gibson has had poetry in Agni, Field, the Greensboro Review, the Harvard Review, Northwest Review, Pleiades, and Slate, among others. Her awards include fellowships from the Massachusetts Cultural Council, the MacDowell Colony, and a Fulbright Grant. She teaches poetry at Tufts University. Jeremy Allan Hawkins is a poet born in Staten Island, NY. He has recent work appearing in Tin House, Hayden’s Ferry Review, Pank, and Super Arrow. He currently lives and teaches in France. Elizabeth Hazen’s poems have appeared in the Threepenny Review, Fourteen Hills, Painted Bride Quaterly, and elsewhere. She lives in Baltimore. Alec Hershman lives in St. Louis, where he teaches at the Stevens Institute of Business and Arts and at the Center for Humanities at Washington University. Other poems can be found in Phoebe, the Sierra Nevada Review, and Washington Square. He also has an e-​​chapbook, Jollyboats, available at White Whale Review. George Higgins’s poems have or will soon appear in 88, Pleiades, Best American Poetry 2003, Dislocate, Nimrod, Poetry Flash, Slab, and many other literary journals. He is a graduate of the Warren Wilson MFA program for writers where he was a Holden Fellow. He lives in Oakland with his wife and daughters, and is a criminal defense lawyer. Dan Howell’s collection of poems is Lost Country (Massachusetts). Awards include a Writing Fellowship (Poetry) at the Fine Arts Work Center in Provincetown, the Tom McAfee Discovery Award (Missouri Review), and a citation for Notable Essay in Best American Essays. Currently, he lives and works in Lexington, Kentucky. Nancy Kassell’s work has appeared in Notre Dame Review, Borderlands, Eclipse, Willow Springs, Peregrine, Westview, Salamander, and in the anthologies Verse and Universe: Poems about Science and Mathematics, and Family Reunion: Poems about Parenting Grown Children. She lives in Brookline, MA. Susanna Kittredge has a Master of Fine Arts in Creative Writing from San Francisco State University. Her poems have appeared in publications such as Sidebrow, Shampoo, Parthenon West Review, 580 Split and Instant City, as well as the anthology Bay Poetics (Faux Press, 2006). She currently lives in Boston, where she is earning a degree in elementary and special education. Alyse Knorr is the poetry editor and blog co-​​director of So to Speak: A Feminist Journal of Language and Art. She is pursuing an MFA in poetry at George Mason University, where she teaches English. Her work has appeared or is forthcoming in Cold Mountain Review, the Minnesota Review, elimae, Moria, Dark Sky Magazine, and others. Several of her poems will also appear in the online anthology Poetry Ark. Born in 1967 in Shandong, Lan Lan is an influential lyrical poet in contemporary China. She is the national award-​​winning and bestselling author of nine poetry titles, including Life with a Smile (1990), Songs of Romance (1993), Inner Life (1997), Sleep, Sleep (2003) and From Here, to Here (2008). She lives in Beijing. Fiona Sze-​​Lorrain writes and translates in French, English and Chinese. Her work includes Water the Moon (Marick Press, 2010) and prose translations of Hai Zi (Tupelo Press, 2012, forthcoming). One of the editors at Cerise Press, and a zheng concertist, she lives in France. Mercedes Lawry has published poetry in Poetry, Rhino, Nimrod, Poetry East, and Seattle Review, among other journals. Her chapbook, There Are Crows in My Blood, was published by Pudding House Press, and she has a chapbook, Happy Darkness, forthcoming from Finishing Line Press. Jenna Le was born in Minnesota, a child of war-​​era Vietnamese immigrants. A graduate of Harvard University and Columbia University, she works as a physician in New York City. Her poems have appeared in Barrow Street, Ellipsis, the New York Quarterly, Post Road, and elsewhere. Author of short stories, novels, and works for stage and radio, Norman Lock’s most recent books are the novel Shadowplay (Ellipsis Press) and Grim Tales (Mud Luscious Press). He received a 2011 poetry fellowship from the National Endowment for the Arts. J. S. A. Lowe will be entering the University of Houston’s poetry and literature PhD program this fall. Her poems have appeared in Agni, American Scholar, Chicago Review, Denver Quarterly, and Harvard Review; her limited-​​edition chapbook DOE was published by Particle Series Press. Angie Macri was born and raised in southern Illinois. Her recent work is forthcoming in Cave Wall, Rhino, and Third Coast, among other journals, and is included in Best New Poets 2010. A recipient of an individual artist fellowship from the Arkansas Arts Council, she teaches in Little Rock. Al Maginnes published two chapbooks in 2010, Between States (Main Street Rag Press) and Greatest Hits 1987–2010 (Pudding House Publications). His most recent full-​​length collection, Ghost Alphabet, won the 2007 White Pine Prize. He lives in Raleigh, North Carolina, and teaches at Wake Technical Community College. David McCann teaches courses on Korean literature at Harvard University, and a course called Writing Asian Poetry, where he first explored the Korean sijo verse form in English. Urban Temple, a collection of his sijo, was published last year by Bo Leaf Press. Leslie McGrath’s poems have been widely published, most recently in Slate, Tiferet, Long Poem Magazine (UK) and Pank. She received the 2004 Pablo Neruda Prize for Poetry. Her first collection of poetry is Opulent Hunger, Opulent Rage. McGrath teaches creative writing and literature part-​​time at Central CT State University and serves on the board of the James Merrill House in Stonington, CT.
Carolyn Miller is a poet and painter living in San Francisco. Her most recent book of poetry, Light, Moving, was published by Sixteen Rivers Press in 2009. Her first full-​​length collection, After Cocteau, was published by the same press in 2002. Her poetry awards include the James Boatwright III Prize for Poetry from Shenandoah, and the Rainmaker Award from Zone 3. Carolle Robin Morini lives and works in Boston. “Poem of Tender” is from the manuscript Stay. Greg Nicholl lives in Baltimore and is an assistant editor at the Johns Hopkins University Press. His poetry has appeared in Arts & Letters, Barrow Street, Crab Creek Review, Harpur Palate, Natural Bridge, and elsewhere. Brianna Noll is a doctoral student in the Program for Writers at the University of Illinois at Chicago. Recent work has appeared, or is forthcoming, in The Pinch, Redivider, and the New York Quarterly. Anthony Opal lives in Chicago, Illinois, where he is a graduate student at Northwestern University. His work has recently appeared or is forthcoming in the Spoon River Poetry Review, New Madrid, Harpur Palate, and Boston Review. Joyce Peseroff’s most recent books are Eastern Mountain Time and Simply Lasting: Writers on Jane Kenyon. She teaches in the MFA Program at UMass Boston. Gregory W. Randall’s chapbook Double Happiness was selected by Mark Doty for the 5th Annual Camber Press Chapbook Award and is forthcoming. His chapbooks Uncommon Refrains (The Lives You Touch Publications) and A Room in the Country (Pudding House Press) were published in 2010. Greg is a recipient of a Dorothy Sargent Rosenberg Prize for 2008. Susan Rich’s three collections of poetry are The Alchemist’s Kitchen (2010), Cures Include Travel (2006), and The Cartographer’s Tongue /​ Poems of the World (2000) which won the PEN USA Award for Poetry. She has received awards from the Times London Literary Supplement, Peace Corps Writers, and the Fulbright Foundation. Although born a Bostonian, she has recently been included in New Poets of the American West. Martin Rock’s poetry appears or is forthcoming in the Tampa Review, Diagram, La Petite Zine, Tuesday; An Art Project, Forklift, Ohio, and other journals. His collaborative chapbook with Phillip D. Ischy, Fish, You Bird, was published by Pilot Poetry. He is managing editor of Epiphany, a Literary Journal and editor in chief of Loaded Bicycle, a new online literary magazine of poetry, translation, and art. James Silas Rogers edits New Hibernia Review, a journal of Irish Studies. His chapbook Sundogs was published by Parallel Press in 2006. His poems have appeared in such publications as Nimrod, Spiritus, and Poetry East­. Patricia McKernon Runkle’s poems have appeared in Frogpond and Modern Haiku. Her music and lyrics have been published by Boosey & Hawkes. When not writing, she volunteers at a grief support center. Aimée Sands’s first book of poems, the Green-​​go Turn of Telling, is forthcoming from Salmon Poetry in 2012. Her work has appeared in Field, Poetry Ireland, Poet Lore, Measure, Beloit Poetry Journal, and Lyric Poetry Review. She is co-​​director of the Brookline Poetry Series, now in its 10th season. Jason Schossler’s first book of poetry, Mud Cakes, is due out from Bona Fide Books in 2011. He is the inaugural recipient of Bona Fide’s Melissa Lanitis Gregory Poetry Prize, and the 2009 winner of Reed Magazine’s Edwin Markham Poetry Prize. His work has appeared in The Sun, North American Review, and the Antioch Review. Laura Shearer teaches and writes in New York. She holds degrees from Barnard College and New York University. Noel Sloboda lives in Pennsylvania, where he teaches at Penn State York and serves as dramaturge for the Harrisburg Shakespeare Company. He is the author of the poetry collection Shell Games (2008) as well as two chapbooks, Stages (2010) and Of Things Passed (2010). Barry Sternlieb’s work appears in Poetry, the Southern Review, the Gettysburg Review, Virginia Quarterly Review, and is forthcoming in the Sewanee Review. He received a 2004 Massachusetts Cultural Council Poetry Fellowship, and his latest book is Winter Crows, which won the 2008 Codhill Press Chapbook Award. He edits Mad River Press, specializing in handmade letterpress broadsides and chapbooks since 1986. Julia Story’s first collection, Post Moxie, received Sarabande Books’ 2009 Kathryn A. Morton Prize and Ploughshares’ 2010 John C. Zacharis First Book Award, and was named one of Coldfront’s Top 30 Poetry Books of 2010. Recent work has appeared in the Paris Review, Octopus, and Salt Hill. A native of Indiana, she now lives in Somerville, MA. Emily Wall is a poet and assistant professor of creative writing at the University of Alaska Southeast in Juneau. She has been published in a number of literary journals in the U.S. and Canada. Her first book, Freshly Rooted, came out in 2007 with the Irish press Salmon Poetry. Thom Ward is the author of five books of poetry. His collection Etcetera’s Mistress will be published in 2011 by Accents Publishing. He lives in western New York. His vices include reading, golf, and martinis. Kathleen Weaver is a poet, anthologist, and translator from Spanish. Her recent work is a biography, Peruvian Rebel, The World of Magda Portal, With a Selection of Her Poems, Penn State, 2009. She lives in Berkeley. Marian Willmott is a writer and visual artist who divides her time equally between poetry and painting. Her poetry has appeared in numerous literary journals and in a chapbook published by Pudding House Publications. Jody A. Zorgdrager earned her MFA from Warren Wilson. Her first book, Of Consequence, was published by the Backwaters Press in 2008. She has new work appearing in Hayden’s Ferry Review, Crab Creek Review, and Kestrel.